For big beefy flavor and a meal that can feed many, you need to break out the beef brisket recipes. Dinner Without Brisket? I Wouldn't Risk It! Beef brisket is the way to go when you need to feed a lot of people. Brisket can be cooked slowly in your oven as a braise or slowly on your grill as a smoked meat or a barbeque. Ether way you cook it, you are going to have to cook it slowly. This is because the brisket part of the cow is attached to the shank of the cow. The shank of the cow is the front leg and, as you can guess, it's a part of the cow that gets a pretty good workout every day. If you have read the steak marinade article you will know that the parts of the cow that get a lot of exercise are both tough and flavorful. Tough cuts of meat need time to cook. Long, slow cooking methods give the connective tissues time to break down and this will make the meat tender. 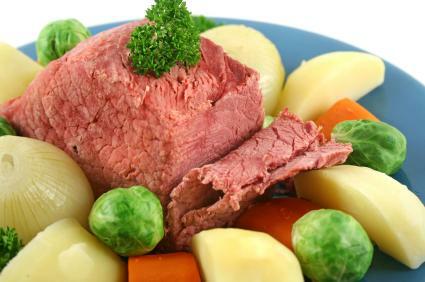 Some beef brisket recipes, like corned beef, rely on long marinating times with salt and spices and then a long cooking time to tenderize the beef. Braising is a method of cooking that a lot of professional cooks rely on, some would say over-rely on, because it tenderizes meat and brings out the best flavors of whatever it is that is being braised. Seasoning - You can season your beef brisket before you brown it or you can let the braising liquid season it for you, it's up to you. Bear in mind that salt on the surface of meat will prevent the beef from browning properly and herbs have a tendency to burn at the temperature that you will need to brown the meat. If you are so inclined to season your beef brisket before browning it, a marinade will work best and you can use the marinade as part of the braising liquid. Browning - Dry the beef brisket thoroughly before browning or it will stick to whatever surface you are using to brown the brisket. Braising liquid - The braising liquid should never cover more than 2/3 of the brisket. Add the vegetables last - vegetables take less time to cook than beef. Add them 15 to 20 minutes before the beef is done. Making the sauce - Using the liquid that remains in the pan after the meat is done, you can make a fabulous sauce to go with your beef brisket. Strain the liquid into a saucepan and place over medium high heat. To quicken the thickening of the sauce, you can use slurry. Slurry is a mixture of cornstarch and cold water. Use three tablespoons of cornstarch and three tablespoons of cold water and mix them together. When the sauce comes to a boil slowly add the slurry while stirring the sauce. As the sauce boils it will thicken. Mix together the salt, cayenne, garlic powder, black pepper, onion powder, dried oregano, dried thyme, and paprika. Set aside. Preheat a large skillet with the oil. Rub the brisket with the seasoning mix. Sear the brisket for two minutes on each side. Remove from the heat and make small slits in the beef. Insert the cut garlic into the slits. Place the brisket into a roasting pan and bake at 400 degrees for 40 minutes. Remove from the oven and add the sliced onions, stock, bay leaf, and water. Reduce the heat to 350 degrees and roast for two and a half hours. After two hours of cooking you can add some quartered new potatoes, quartered onion, and sliced bell peppers. Remove the meat from the pan and let sit for ten minutes before slicing. You can reduce the cooking liquid to make a sauce if you like.